Effective and efficiently delivered environmental monitoring programs can help aquaculture grow in a socio-economically and environmentally sustainable manner. Monitoring the effect a fish farm has on its surroundings allows for regulation and modification of operations to keep impacts to an acceptable and manageable level. This is done by studying the ocean floor under and surrounding the cage, or net pen, to see how much waste is accumulating. Monitoring typically involves visual inspection and evaluating how much organic loading from fish feces and uneaten food has disturbed the natural ecology. In most jurisdictions, field data currently are collected with sediment samples for geochemical or biological analysis, combined with a video survey of the sea floor. Currently, commercial divers collect this information. However, as the trend in aquaculture towards deeper sites offshore continues, it is becoming more difficult and dangerous to use divers. Recent innovations in aquaculture methods, the lack of suitable aquaculture sites near-shore and the requirements of species new to aquaculture all are contributing to the growing trend towards offshore aquaculture. Because there are limitations in using divers for environmental monitoring, there is a need for reliable and consistent data collection at the deeper sites. HMSCs new division, the International Aquaculture Innovation Centre (IAIC), is a pre-commercial testing facility addressing the issue. IAIC investigates issues challenging sustainability and productivity of the aquaculture sector. Gerhard Pohle, senior research scientist at HMSC, started the ROV project after hearing about a conversation between William Robertson, HMSCs new executive director, and Larry Ingalls, president of Ocean Horizons Ltd., a salmon-farming company. Bills experience in aquaculture operations and Larrys desire to adapt monitoring to the industry moving offshore led us to investigate ROVs as a possible alternative to scuba divers for work at deeper sites, said Pohle. ROVs are unmanned submersibles; they are not constrained by the depth limitations of divers, and they may be a safer and more efficient method of collecting data at deeper sites. ROVs are seeing increasing applications ranging from oil platform and pipeline maintenance to underwater tree log recovery and deep-sea exploration. This project is pioneering ROV use in environmental monitoring for the aquaculture industry. Realizing the large scope and cross-jurisdictional application of this project, institutions from both sides of the U.S.-Canada border cooperated and contributed in the undertaking. 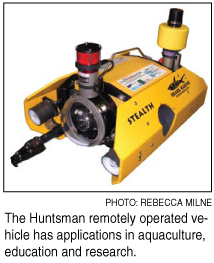 With the help of the New Brunswick Environmental Trust Fund, the Gulf of Maine Council on the Marine Environment, the Canadian Industrial Research Assistance Program of the National Research Council, Business New Brunswick and Ocean Horizons, the HMSC was able to purchase and deploy a Stealth 2 ROV from Shark Marine Technologies Inc., St. Catharines, Ontario. Fisheries and Oceans Canada also contributed training in geochemical sample analysis and advice on the design and specifications of the sediment sampler. While ROVs have been around for some time, Pohle noted, it has only been in recent years that costs have become reasonable for smaller organizations such as ours. As in the computer industry, with costs coming down, capabilities of ROVs have actually gone up. Other than cost, size and weight are particularly important factors, he said, because transportability and ease of handling on board vessels are essential. This particular machine is relatively small, and with a weight of about 45 kilograms (100 pounds), does not require any special gear to get onto a boat or in and out of the water. Basically, we can pack everything into a 1.2-by-0.9-meter (4-by-3-foot) container and head off to wherever we are needed, he said. The ROV is rated to a depth of 305 metres (1,000 feet), and so is capable of monitoring deep water sites where monitoring would have been impractical or incomplete in the past. The ROV is operated with a computer topside that is connected to the vehicle by a 305-metre (1,000-foot) umbilical cable. The ROV pilot commands the ROV via a computer using a wireless controller device. For navigation, the pilot uses a live video feed, scanning sonar that works like radar to detect obstacles, and a tracking system that displays the ROVs precise position relative to the deployment vessel. In addition to a standard grappling arm, the ROV is equipped with two video cameras, one color and the other a low-light, black-and-white camera, useful in deep water or when using the two floodlights is not helpful. This is the case when light reflects back from suspended matter close by or when the lights attract so many organisms that they interfere with visibility, Pohle noted. Cameras are principally used for navigation of the ROV and to run video for environmental monitoring. They are crucial for using the unique sediment sampler. Development of the sampler was key to the success of this project, as obtaining undisturbed sediment samples is necessary for proper analysis. We needed to obtain at least the top two centimetres (0.8 inch) of sediment in an as-is state to correctly determine surface conditions, Pohle said. It is important that the sediment sample is undisturbed because the required geochemical information is in the top 2.54 centimetres (1 inch) of the sediment. In order to accomplish this with an ROV, the HMSC commissioned a sampling apparatus developed specifically for this purpose. The sediment sampler uses a pneumatic piston powered by a small air tank to push in and retract a triplicate set of sampling tubes from the sediment. Custom-made, one-way valves prevent the loss of material when the sample is retracted. A rotating carousel then moves the tubes out of the way and brings another set of triplicate tubes into deployment position to take the next set of samples. Watching this on screen, the operator can make adjustments in positioning the tubes. In this way, three triplicate samples can be taken per dive. Obtaining triplicate samples increases statistical confidence in the results and gives an indication of variability. The usefulness of ROV technology in aquaculture monitoring can be seen in favourable costs and clear safety benefits, particularly at deep water sites. Other advantages to the fish farmer include real-time video feedback at the surface so that farm management can instantly adjust operations, such as changing feeding schedules. The ROV also can be more frequently deployed, allowing more feedback to the operator and the ability to mitigate environmental impacts as they occur. The ROV presently is undergoing a factory refit to enhance it with a laser scaling system for determining the size of objects during visual surveying. Improvements are being made to the positioning system, and on-screen readouts of water temperature will be available. A clamshell sampler that can take larger volumes of material, such as for faunal analysis, also is being field-tested. 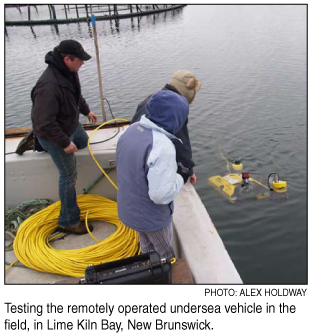 For example, since the fish farm project, the ROV has been used on a number of missions related to ocean energy extraction in the Bay of Fundy. A renewable resource that can meet the social standards of sustainability, tidal in-stream energy development is currently a major area of activity in both Canada and the United States. With its high ocean tidal cycles, the Bay of Fundy is of particular interest. The HMSC ROV has been used over the last six months to characterize physical and biological attributes of potential sites using videography. This included a number of successful fly-through dives at depths exceeding 100 metres (328 feet), at sites in Head Harbour Passage and Western Passage near the Canada/U.S. border that experience current speeds of up to 6 knots. The ROV collected important evidence on substrate suitability and biological diversity that will help in the overall assessment in terms of impact and resource potential. 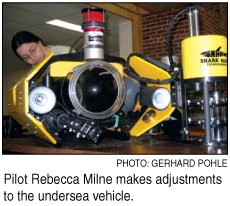 Rebecca Milne works at Huntsman Marine Science Centre in St. Andrews, New Brunswick, as an ROV and lab technician. Gerhard Pohle is senior research scientist at the Centre. 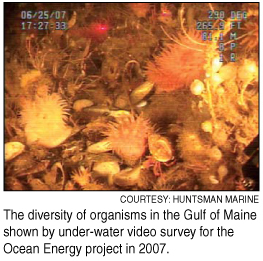 The aquaculture research in this story was funded by a grant from the Gulf of Maine Council on the Marine Environment, which also sponsors The Gulf of Maine Times.